Yes, it is a fungi. I think it could be King Alfred’s Cakes. Except I’d say it’s too pale. But maybe that’s because it’s wet. Fungi tend to change colour when dry. And while I’ve titled the post Ruby Carbuncles, yet to me these weird fungi also resemble kidneys, bloodless kidneys. 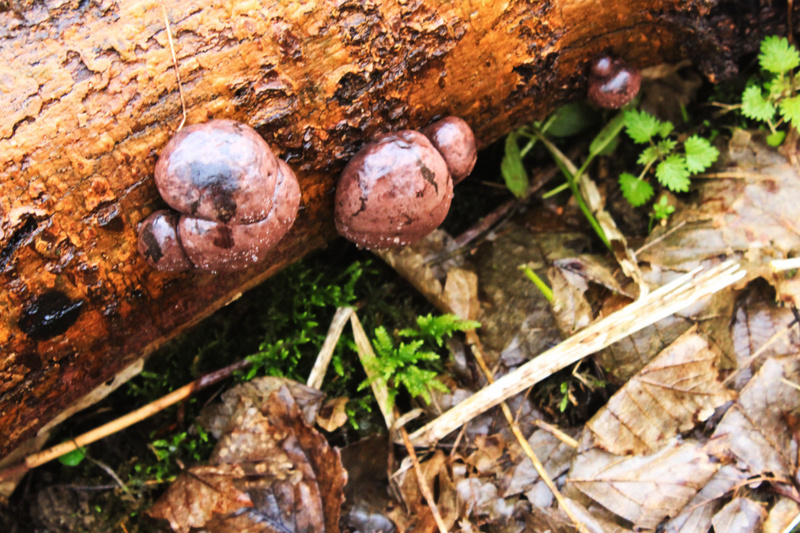 This entry was posted in Photos and tagged Fungi, Photos. Bookmark the permalink. We have some King Alfred’s Cakes in the park nearby, but you’re right, when they’re the colour above they do look like kidneys! So is that what they are? The ‘Cakes’ are much darker (like burnt cakes) in my guide book. These ones kinda make me feel queasy, like they’re bits of intestines squeezed through the skin of the wood. Hernias! The ones I’ve seen are much darker, but they definitely do look like them and I’ve seen pictures where they look lighter. King Alfred had weird taste in cakes; those look disgusting! Carbuncle is more like it, I agree. Okay, maybe if they weren’t wet… Nope. Mmm, horse droppings cake, my favorite! After reading your post, I searched online for the mushrooms and ended up finding the story behind them. Not cakes at all (not the sweet ones I’m thinking of, at least) but burned bread loaves — now it makes sense! Kidneys or weird little snails! They do and no, I would not be tempted to eat them at all!